Footprints in the Butter: Frugal Fridays: SPLURGE! 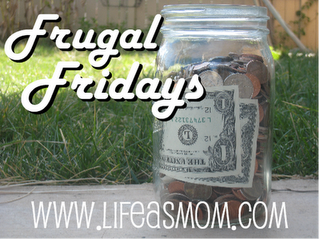 I've never participated in the Frugal Fridays hosted by Life as a Mom. So this week, I'm jumping in with an unusual frugal tip. Splurge. Spend money. Buy the more expensive item. Isn't frugal all about spending less? Well, overall, yes. But sometimes, spending "foolishly" really makes sense. If you grew up on Skippy or Jif, for example, but are purchasing generic to save fifty cents a week, good for you. But if every time you pull the peanut butter out you are feeling sorry for yourself that you can't afford the "good stuff" then maybe you need to rethink things. If generic is making you feel deprived, maybe it isn't worth the $2/month in savings. Save money somewhere that makes you feel good about being such a thrifty person. Is there some treat that you know is an extravagance, that other frugally minded people always list as a way to save big bucks, but you just don't want to give it up? Then don't. You don't have to give up *everything* and you don't have to do it all at once. Years ago, my best friend and I would go garage saling on Saturdays and then go have an expensive cup of coffee at Pikes Perk. Everything either of us read about saving money and frugal living told us that spending $4 for a cup of coffee was a huge waste. Yes, if we cut that out every week (we didn't go every week though), we'd have $200 more at the end of a year. But $200 was a worthwhile investment in our friendship, and it made us both feel better about the things we were giving up. There is nothing wrong with deciding that there is some little luxury that you just don't want to go without. And then truly enjoy it, guilt free, and go back to washing out plastic bags with a revived spirit. If spending more on boneless meat means you are more likely to make dinner instead of ordering take-out, or if buying packages of pre-cut carrot sticks means you are less likely to stop and grab a snack on the way home, then by all means, splurge on the convenience. Once you are used to not ordering out or picking up expensive snacks, maybe you'll decide to do some extra prep work too. But you can take baby steps. You don't have to start by growing your own carrots. Start where you can. Obviously, if money is beyond incredibly tight, you probably can't splurge at all. But it's kind of like dieting... for many people, if you swear never to eat chocolate again, or anything else unhealthy ever ever ever, you end up thinking too much about all those wonderful things you have given up. If you budget in a small treat here and there, it is far easier to remain disciplined and motivated the rest of the time, knowing you haven't given up everything. Of course, cold turkey is the best answer for some too. So, I'm giving you permission to wisely choose an item or two, and to splurge! You can check out loads of far better frugal tips here. Very good tips, thanks for the reminders. Great post, Debra! I completely agree with you.